Bristol is a city in the United Kingdom. It is home to nearly 500,000 people. The River Avon runs through it to the Severn estuary. It is between the counties of Gloucestershire and Somerset. In 1373, King Edward the Third ordered that it should be a county itself for ever. Its name means "the place where the bridge is" in Old English. It has been a port for 800 years, but now ships are too big to reach it. It has a new seaport at Avonmouth. It has many historic churches and other buildings. The Clifton Suspension Bridge crosses high above the river. Bristol was a centre for the slave trade. 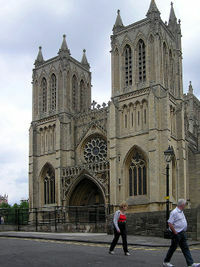 Bristol was badly damaged during World War II. It now has many new factories and offices. The Concorde supersonic airliner was made here. Renowned for its warm welcome and comfortable surroundings, the Arnos Manor Hotel offers elegant accommodation and modern facilities to make your stay in Bristol a pleasant one. Conveniently placed close to the heart of the city, the Arnos Manor Hotel is only a short distance from the airport. The hotel offers 73 comfortable accommodation units equipped with all the facilities that you would expect to find in a modern hotel. The onsite restaurant serves a range of superb menus including many vegetarian dishes. After a tiring day guests can sip their favorite drink at the cocktail bar that offers an extensive and imaginative list of wines to choose from. For business travellers, the hotel offers a selection of well appointed meeting rooms that can accommodate up to 150 delegates. Top end luxury accommodation with a multitude of exclusive dining options makes this hotel truly unique. 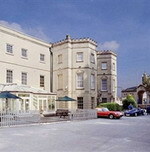 Situated in a peaceful haven overlooking gardens in a beautiful Georgian Square, this exclusive, elegant 42 bedroom period hotel, prides itself on its 1st class hospitality creating a professional yet personal, friendly atmosphere. As Bristol's first Art Hotel, the Berkeley Square really is one of a kind, boasting a relaxed yet vibrant mood and an elegant, eclectic style. Hotel guests have full access to the Club throughout their stay and are free to enjoy the dining room, lounge area, exclusive bar, and new outside terrace. Our guests also have exclusive discounted rates at the Berkeley Centre, a health, fitness and wellbeing centre a stones throw away from the hotel. Welcome to Cadbury House Hotel, Health Club & Spa, Bristol and the South West’s newest 4 star contemporary chic hotel with a difference! A fantastic venue whether you are visiting for business, leisure, conference, wedding or just for lunch. Cadbury House Hotel, Health Club & Spa brings something very special to the region and Bristol, with a fantastic location – only minutes from M5 motorway junctions, Bristol International Airport and Bristol City Centre, set against a backdrop of woodland this semi-rural location is complemented by fantastic views across the Bristol Channel and beyond into Wales. Offering luxury accommodation in our 72-bedroom hotel, fantastic conference & banqueting facilities, the complete wedding package, an award winning health club, over 80 treatments on offer from the spa, our very own hair salon and executive car hire on site – you will want to try them all! Our hotel restaurant has just been awarded 2 AA Rosette for its fine dining and excellence in food. Situated only 2 minutes walk from Temple Meads station in the centre of Bristol. 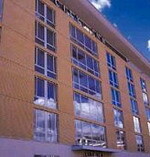 The hotel is only 10 miles from Bristol International Airport with easy access to the M4. Free broadband internet access, Non-smoking rooms available. 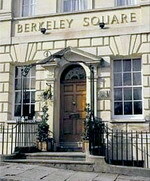 Voted one of the top ten restaurants in Bristol and Bath the City cafe offers exceptional food at good value. It has 2 AA rosettes, and a very pleasurable experience to dine here. A relaxed, fresh, contemporary hotel with excellent facilities and an award-winning restaurant serving innovative modern-European dishes and simple classics. 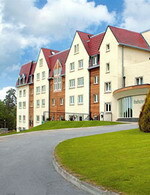 The hotel represents great value for money. Situated in the heart of the City, within easy reach of Broadmead Shopping Centre, the many bars and restaurant in the Docks area and all other major attractions. Discover all that this Bristol Hotel has to offer, 15 minutes from Bristol City Centre and 5 minutes from Bristol Parkway Train Station the Holiday Inn Bristol Filton is a great location for business and leisure travellers situated in 11 Acres of land with its own Fishing Lake. The Hotel has two restaurants, Sampans Oriental, and The Junction, plus a fully licensed lounge and bar. From a great breakfast to a relaxing meal in the evening, our team looks forward to welcoming you. The hotel is located within close proximity to UWE, Abbeywood, Airbus and Aztec West, and easy reach of the M4 & M5 motorway network with 300 complimentary car parking spaces. Our Spirit Health and Fitness Club has an indoor pool, sauna, gymnasium, and onsite Beauty Therapist. 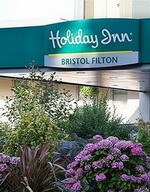 The Holiday Inn Bristol Filton is within close proximity to Bristol’s Cabot Circus Shopping Centre, The Mall Cribbs Causeway, and Bristol Zoo and is a great base explore the south west including the historic city of Bath, Cardiff’s Millennium Stadium, and the Cotswolds. 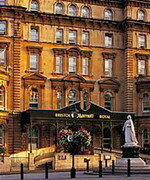 Situated next to Cathedral and adjacent to Bristol's Historic Waterfront, the Marriott Royal Hotel occupies one of city's most prominent sites. The Marriott Hotel with its handsome Victorian facade combines the best of its style and character with contemporary luxury. 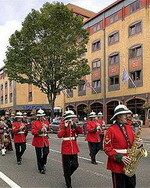 The Bristol Cathedral, Cheddar Caves, Roman City of Bath, Wooley Hole Caves and Zoo are the famous places of interest. A 24-hour room service is also available for your conveniences. Guests can experience fine and delicious cuisines served at the in-house restaurant in an informal and friendly atmosphere. You can also chill out with a fine drink at the cocktail bar after a weary day. In addition, the hotel also features an array of recreational facilities including fully equipped fitness centre, swimming pool, jacuzzi, spa and sauna for health conscious guests. Offering all the convenient facilities, Novotel Bristol Centre welcomes you for an unforgettable stay. Located in the heart of Bristol, this elegant property is only a 2-minute walk from the Temple Meads Station, 5-minute walk from the city centre, 15 kilometres from the Bristol Airport and is close to the city's leisure attractions. The hotel offers 131 bedrooms that provide modern comfort, a unique feeling of spaciousness and contemporary decor for both business and leisure travellers. You can dine in elegance at the onsite restaurant that serves delicious international cuisine for you to relish. The bar is an ideal place to enjoy your favourite drink after a tiring day. At leisure you can browse the net, workout at the gymnasium or explore the city attractions.